At 9:30 on Sunday mornings when the Chicago Cubs play at home, the Rev. Burke Masters arrives at Wrigley Field and heads to Section 209. He has about 30 minutes to celebrate Mass, which at various times is attended by players, coaches, staff and sometimes even members of the opposing club. Father Masters, who played baseball in college and even for a Chicago White Sox farm team, has served as the Catholic chaplain for the Cubs since 2013. It is a volunteer gig and he drives about an hour to Wrigley from the neighboring Diocese of Joliet, where he serves as director of evangelization. While he enjoys the perks of being a baseball chaplain—watching games when he has the time and even taking batting practice with the pros—he sees his job as a form of ministry. “It feels like being a pastor, with the parish at the stadium,” he said. He holds Bible studies in the locker room, checks in with players and keeps up on news about the team should anything break that might require some pastoral insight. Father Masters wears a clerical collar and walks through the ballpark before and during the game, saying hello to familiar faces in the stands. One time, an employee he knew called him over and explained that she wanted to marry in the church, but she needed help understanding annulments. Father Masters accompanied the woman through the process and helped her navigate church bureaucracy. 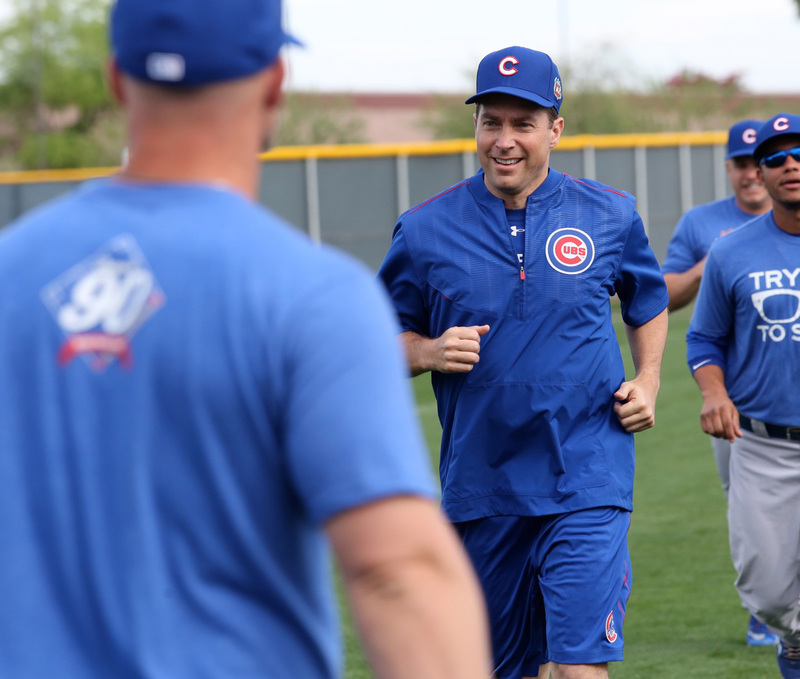 He demurred when asked which players attend Mass or who has come to him for counsel, though he noted that sometimes word gets out about who worships, citing a 2016 Chicago Tribune photo of former Cubs catcher Miguel Montero receiving Communion. He said Cubs manager Joe Maddon, a Catholic who appears in fundraising materials for the local Catholic Charities, supports his work. Father Masters connected with the Cubs through Catholic Athletes for Christ, a Virginia-based organization that since its founding in 2006 seeks to provide Catholic chaplains to teams in Major League Baseball and the National Football League. Each week, Catholic Athletes for Christ distributes information about where Masses are being celebrated. On the weekend of Sept. 15, for example, there were 14 Mass locations. The stadiums where Mass was available included Fenway Park in Boston, Progressive Field in Cleveland and AT&T Park in San Francisco. The organization has active chapters with most M.L.B. teams—including both Chicago teams—according to the group’s baseball coordinator, Kevin O’Malley. “We are working with the other two teams, the Houston Astros and the Colorado Rockies, to get the Mass ministry up and running,” he said. Mr. O’Malley also said that the two Chicago clubs are unique among their Major League peers. The Chicago teams “are the only ones who do [Mass] outside, physically.” Every other club, he said, hosts Mass in the stadium’s press or family rooms. Catholics are not alone when it comes to chaplaincy in Major League Baseball. At 68, Father Danber does not take batting practice with the team, but he goes to the park every Sunday home game to celebrate Mass for staff and any interested players and coaches. A group called Baseball Chapel provides evangelical chaplains to all teams in the major and minor leagues. The organization has been met with some controversy, with some players saying they felt pressured into prayer services that were not in line with their own beliefs. Back in 2016, when the Cubs were deep into renovations of their historic ballpark, Father Masters said in an interview that he was hopeful the team might include a non-denominational worship space somewhere in the ballpark. That did not happen—at least not yet. The Rev. Bernie Danber, a South Side native and cradle White Sox fan, works with the team on the city’s South Side much the same way as Father Masters does with the White Sox’s North Side rival. He was brought in as the team chaplain after a request from former White Sox player and current radio broadcaster Ed Farmer, who attended St. Rita of Cascia high school with Father Danber. “He asked me if I would want to be the chaplain and say Mass at Sox park on a regular basis,” Father Danber said. That was 20 years ago. This year marks his 21st season serving as the team’s chaplain. Father Danber said that players come on occasion to Mass. Former White Sox catcher Tyler Flowers attended regularly when he was on the team, and he said a number of players from other teams come to Mass when they are in town. He said players from the Cleveland Indians and Kansas City Royals attend Mass regularly when those teams play the White Sox. But Father Danber said his ministry mostly extends to workers at the park. Sox manager Rick Renteria, who managed the Cubs for the 2014 season, talks regularly with Father Danber. Mr. Renteria offered high praise for Father Danber’s ministry. “I think he is genuine, he exudes love; he exudes, what I believe God has called him to do, which is to deal with us as his flock and to minister to us,” he said. Father's time would be better spent ministering to nursing home residents. Dominic Lynch is a writer from Chicago. He has appeared in the Chicago Tribune and RealClearReligion. He publishes The Monthly Memo, a Chicago-focused general interest website and newsletter.